Man Possibly Facing Human Trafficking Charges and Worse, SEVEN OAKS, May 5, 2014 - At 7:48 am on May 3, 2014, Trooper Kevin Burman with the Texas Highway Patrol stopped a Ford F-150 pickup for multiple violations, but that was only the beginning. Trooper Burman stopped the pickup for speeding, driving in the left lane (passing lane) while not passing, and a defective brake light. The driver, Ledys Geovanny Alvarenga, 26, of Cranberry, Pennsylvania produced a Honduras driver's license (not valid for driving in the State of Texas). 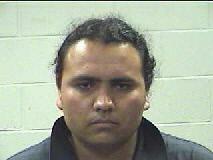 Alvarenga had a passenger with him (a sixteen year old female). Neither were adequate in conversational English. When Burman asked the minor for identification, she produced papers that showed she was supposed to be in custody with a relative in El Paso. Burman brought the two into the DPS Office in Livingston. Needing a translator, he summoned Deputy Rey Davalos with the Polk County Sheriff's Office. Additionally, a representatives Immigration and Customs Enforcement were summoned. As it turns out, the minor had willingly left her residence in El Paso (without her legal guardian knowing she left) to be with Alvarenga. Alvarenga allegedly paid all the expenses to get her and allegedly had intentions of marrying the minor. In addition to his traffic violations, he's possibly facing charges of human trafficking and sexual assault of a child. The case remains under investigation.